What do a Rubik’s cube, a typewriter, a heron, and a fishing pole all have in common? They are all things that cache owner NTM-27 has used to create a cache! 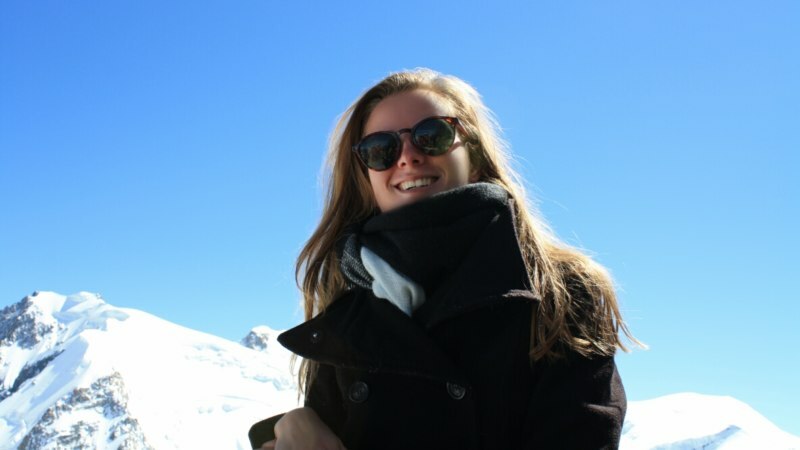 Nynke (NTM-27) is a 22 year old geocacher who combines her passions for geocaching and photography into her inspirational Instagram account, @creativecache. We reached out to learn more about her and how she draws inspiration for creative hides. This just looks like it’s supposed to be there. Surprise! Geocache! Photo by geocacher Lady Nomad. These are just a few ideas. How would you make your geocache truly devious? Tell us in the comments. You can also check out some devious geocache containers at Shop Geocaching. 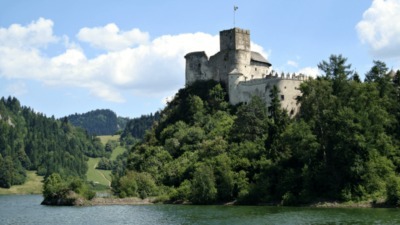 Do you enjoy summer adventures and a good geocaching road trip? We have just the treat for you! Geocaching has teamed up with Airstream for a trackable tag designed for those with a penchant to roam, a heart for exploration and a willingness to Find and Go. The Airstream Silver Bullet Trackable Tag will make its debut at select Geocaching events in the United States in August. 2,000 tags will be released among the events. 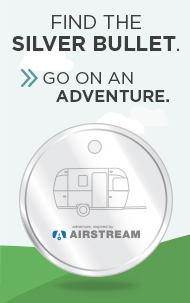 If you can’t make it to the events, keep an eye out for Airstream Silver Bullet Trackable Tags in the wild as they make their way from geocache to geocache and travel across the country. Find one and take it some place incredible, whether it’s a big city or the great outdoors, it’s all about having an experience and sharing it with others. 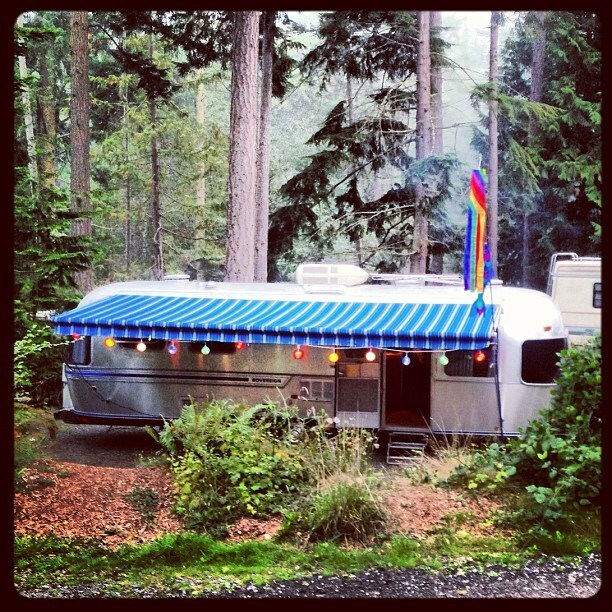 Submit photos of where the Airstream Silver Bullet Trackable takes you for chances to win prizes from Airstream. Photos of the trackable can be submitted to the Airstream Facebook Page. A winning photo will be selected each month starting in August, for Airstream prizes including a t-shirt, a journal, a flashlight, and more! See contest rules for details. To make things even sweeter, geocachers can earn the Socializer Souvenir for attending an event in August as part of the 7 Souvenirs of August program. RandolphAgarn and I camped out to (sneakily) watch the FTF in action. It takes all kinds to make geocaching the quirky, wonderful, interesting hobby/game/community that it is right now. Some like to solve puzzles, others like to trek across mountains; some are serial geocache finders, and others are serial geocache hiders. Altogether, these different types make for a healthy (and fun!) geocaching ecosystem. Within this geocaching ecosystem, I’ve always considered myself your everyday, traditional finder—like moss (a little bit boring), but surely important for some unknown, ecological reason. That is, I used to think of myself like moss. Then, a few months ago, I attended a Maker Madness event hosted by Geocaching HQ. I walked out of the event knowing that I too wanted to create great geocaching experiences for others to enjoy… But I didn’t want to hide just any old geocache. I wanted to hide the Mona Lisa of geocaches. There was, however, one small problem. When it comes to any and all geocache making skills…well, I don’t have any. I never took woodshop. I don’t know anything about Arduino computers. And (much to my puzzle-loving grandfather’s disappointment), I cannot solve the Monday crossword puzzle, let alone design a worthwhile puzzle of my own. So how does one hide a masterpiece geocache without having any relevant Maker skills? RandolphAgarn makes final adjustments to our geocache. So, I used my Phone-a-Friend card to call up my friend and Geocaching HQ mobile developer Arne Moen (Username: RandolphAgarn). He is everything that a Maker should be: creative and innovative with more than a few DIY tricks up his sleeve. And fortunately for me, he enjoys making geocaches more than maintaining them, so we formed a geocache hiding partnership. He built the container and I will be in charge of maintaining his creation going forward. RandolphAgarn and I were so excited/nervous about putting our geocache out in the wild that we decided to sneakily camp out on a nearby bench to watch the FTF (first-to-find) in action. 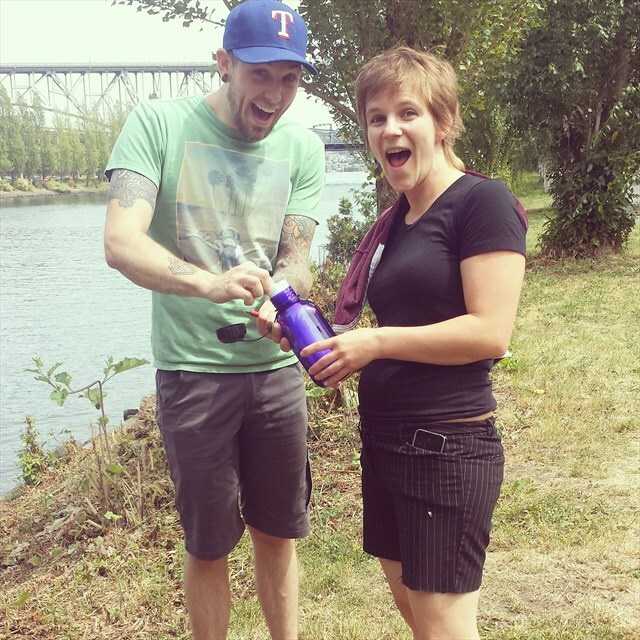 Given our geocache’s proximity to Geocaching HQ (home to 70 plus geocachers with instant notifications set up), we weren’t shocked to see the FTF go to a couple of HQ staffers within 20 minutes of publication. ScatterMyCaches and ReidSomething were pumped to earn their first FTF (but less excited to FTF the giant spider that had been quick to make the geocache its home). 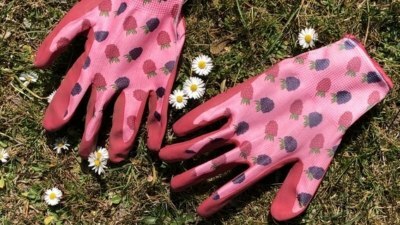 A big congrats also to MedicineManOfSeattle and TrailGourmet for the STF (second-to-find). Okay, so our geocache may not be the Mona Lisa of geocaches, but it sure feels good to have played a part in creating a quality experience that many will be able to enjoy. And, unlike moss, it’s nice to know that we all have the ability to choose what role we’d like to play in our geocaching ecosystem. It’s more fun. ‘Nuff said. You can share the workload. 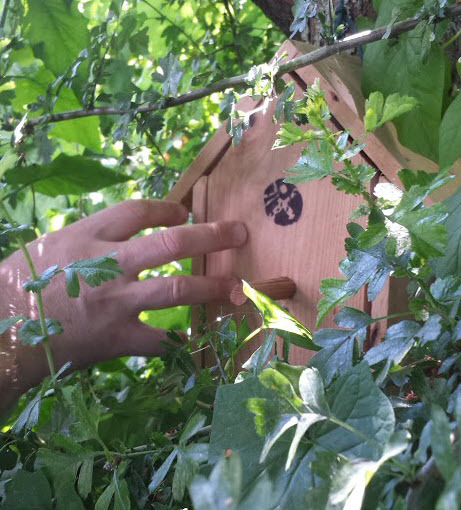 From building a container to maintaining it, hiding a geocache can be a lot of work! Splitting up or sharing responsibilities makes it a whole lot easier. Collaboration inspires creativity. The brain is a wonderful thing. Two brains are even better. 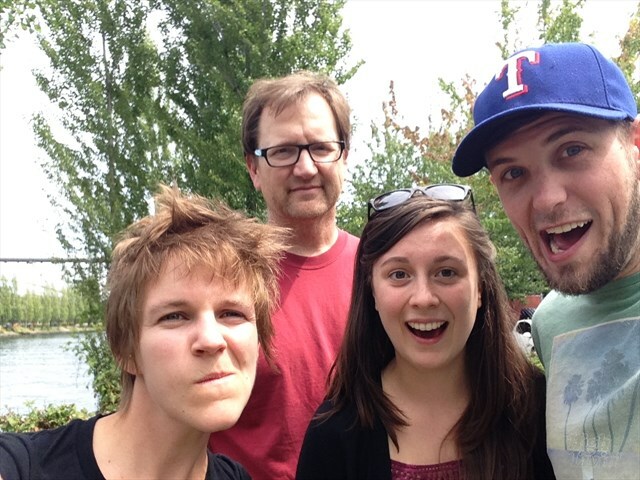 RandolphAgarn and I talked the FTF’ers into taking a celebratory selfie with us! Early finders Jwlatona and COOP. 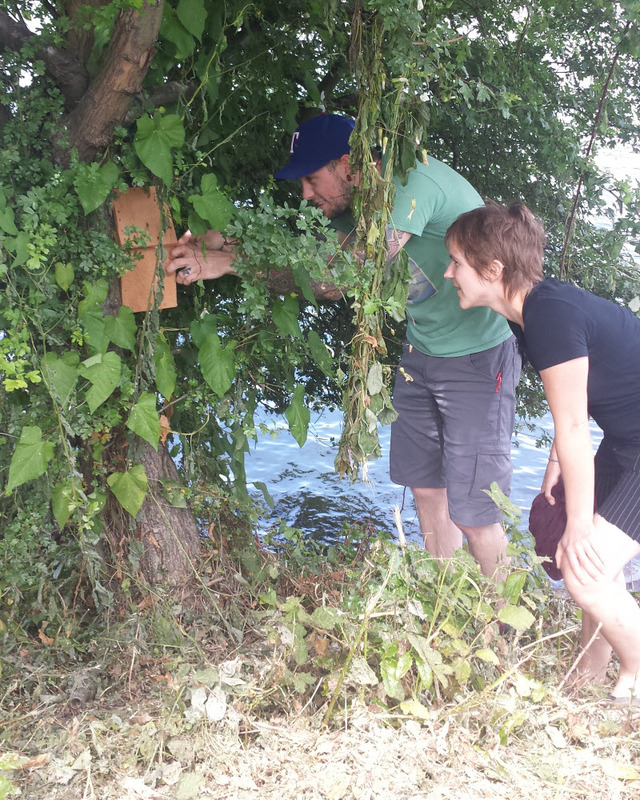 What’s the story behind your first geocache hide? There are plenty of log types out there, but none more fun than earning a smiley by logging a “Found it!” Check out 5 quick tips to inspire your fellow geocachers with your next log entry. Tell Your Story – The geocache log you write is like the preview to a movie. You’re telling geocachers about an adventure they could experience. Maybe your journey involved seeing the first leaves of spring, looking out from a mountain top or meeting other geocachers on the trail. Your logs help other geocachers decide if the geocache looks fun and exciting enough for them to find. Add a Picture – A picture of a geocacher’s crooked smile after a find says a lot about a geocache. It’s easy to upload pictures on the fly with a Geocaching mobile app. If you’re wondering about the power of a picture in a log check out the 1000 most recent log images. It’s an ever-changing visual gallery of geocaching pictures from around the globe. 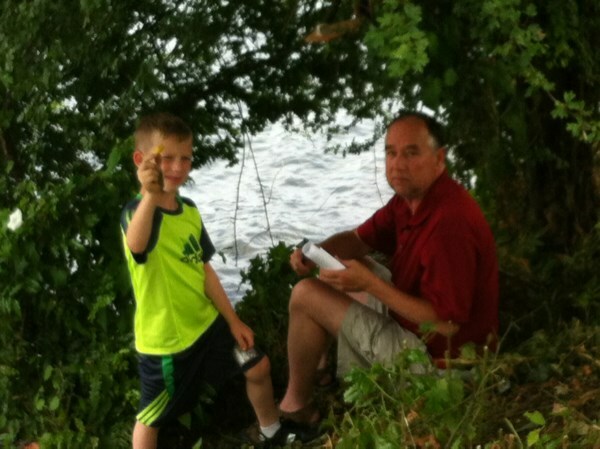 Name Some Names – Geocaching is all about community. Share the geocaching usernames for those who joined you out in the field. 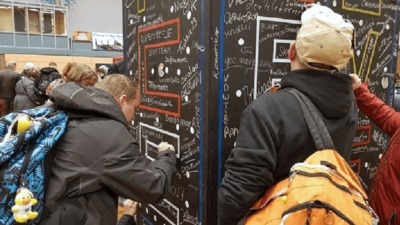 It’s a quick way to help build the local geocaching community and it makes meeting people at Geocaching Mega-Events or Event Caches easier. Add a Favorite Point – Geocaching Favorite Points let you compliment the geocache hider and nudge other geocachers to check out this geocache. While only Premium Members can earn and reward Favorite Points, every can see them. Say Thanks – It’s easy. Watch this, “Thank you for reading this Geocaching Weekly Newsletter.” It feels good. 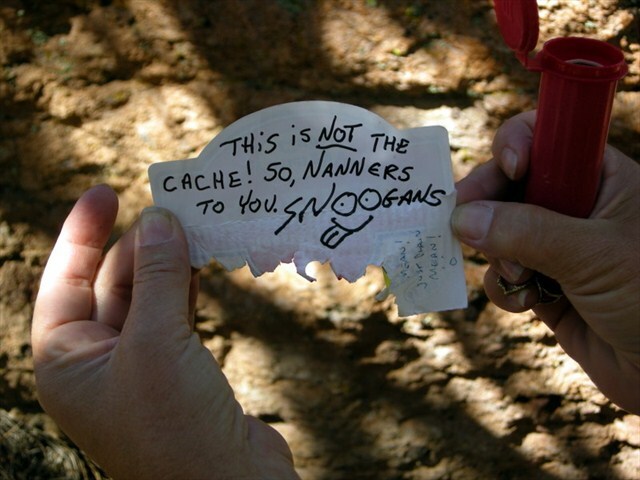 When you log a geocache and say “thank you” it means so much to the geocacher who hid and maintains the geocache. And don’t forget if the geocache needs maintenance leave a “Needs Maintenance” log. Tell us your tip for great logs in comments!